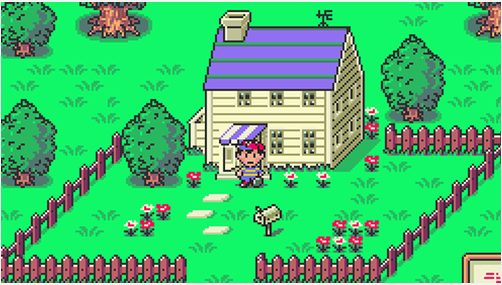 A screenshot of Ness, outside of his home showing off the "Sunday Morning" style of colours that most of the game uses. When I say: RPG, what comes to mind? Is it fighting goblins with swords? Probably. Is it traveling across vast lands in the Medieval Era? Probably. This is why EarthBound is so great. It stays away from dragons and magic and focuses instead on a more modern look. Today, I will be showing you why you are missing out on the amazing, fantastic game that is EarthBound for the Super Nintendo. It's awesome colours, design, music, and characters make it a very enjoyable and hilarious adventure. It is a very underrated game as well, and I hope that by the end of this Let's Look At you will want to play it, as I really want the attention that this game deserves to be given. Without further ado, let's dive in. Our story begins with Gygias, a alien from an unknown race that is set to destroy the world. Ness, a boy that lives outside of the quiet town of Onnet, finds a strange meteorite that has crashed behind his house. He later meets buzz-buzz, a very powerful bee. Buzz-Buzz eventually dies, but gives Ness the sound stone, and tells him to find all eight magical melodies, to help the fight against Gygias. That's all I am going to give out story wise, because I really want you to play the game yourself. The gameplay is your average RPG, with turn-based combat. This may sound a little bland, but it is the little things during the combat that make it so special. The music, the enemy names (New Age Retro Hippie. What?!?) and the enemies themselves are all very unique. The music is very well done, with each kind of enemy you will encounter will have a different theme. (Machine, Weird, Unsettling, Weak) as for the enemies themselves, there are a lot, like the previously mentioned Hippie, Spiteful Crow, Five Kinds of Starmen, and not to forget, the bosses. The final battle against Gygias is extremely creepy, (More on that later!) and the other ones you encounter leading up to him are very cool as well. The game also sheds light on humour, something that I love to see in RPG's. There are plenty of funny moments throughout the game, and the game itself is overall very happy and cutesy. The game has a overall happy tone, but there is one thing about EarthBounds tone like to cover up, and I feel that it needs to be mentioned. Everybody, brace yourselves, because I am talking about the Gygias Is a Fetus/Abortion Theory. Now, I don't usually talk about creepypastas, and I never even mentioned them in my previous articles, but this Theory has so much evidence, it's almost scary. Also, spoilers ahead. When you enter Gygias's lair/cave, you are greeted by a trail of long, glowing intestines. Already a big change of tone from the rest of the game, and it only gets darker from here. After walking up the trail of intestines, you are greeted with the "Devils Machine", a device that looks very similar to the *Ahem, female reproductive system. After the fight with Pokey, he turns the machine off and reveals... Oh god. Look very closely at this screenshot of Gygias. See it yet? Yeah. You should be able to see what looks like to be a Fetus. Simply horrifying. What's even more, is that during the fight, there is even more evidence that backs this theory up. The somewhat distant crying that is sometimes heard during the fight, and especially the things he says. Wow. Who would know that such a child friendly game could hold something this dark? Shigesato Itoi, the games director, states that his idea for Gygias's dialogue came from a incident from his childhood. He accidentally walked into a movie theatre, and thought he saw a woman on screen being raped. He wanted a really scary final boss fight, so Gygias's dialogue was actually based on his thoughts that we're running through his head when the incident happened. What also worth mentioning, is that on pretty much every top ten scary/disturbing bosses list, Gygias is sitting at number one. But a theory is just a theory after all, and Shigesato Itoi gave no definite answer for if Gygias is a fetus or not, and either way, it's a horrifying boss fight. Now that the spoilers are over, I want to continue talking about the game itself. Despite the final boss, the game has a very cool, bright colour style that makes the game feel full of life. A prime example of this is your hometown in the game, Onnet. It's bright shades of Red, Blue, and Green make it look alive and interesting. This is one other thing that sets it apart from other RPG's so well, and it executes it so beautifully that it really makes the game a half ton better. Overall, Earthbound is a masterpiece of gaming. I find it very saddening that only five people on the site play it. (Including Cosmic Owl.) It is a very colourful, fun, engaging, and intuitive RPG that sets it apart from others at the time, like Final Fantasy. It plays and feels like one too, as you can get party members, equip items, and pretty much anything you would ever want from a game like this. It has a great story too, one that I recommend you experience yourself. It went for a modern design, and we got one. You can go to hospitals and hotels, withdraw money from your ATM card, and so much more. It's a game that did so much more then just replace crossbows and potions to slingshots and hamburgers, it truly set the gold standard for some of the other games of its time. It has a very active Fanbase too, with sites like Starmen.net being active daily. And for a SNES game, that's pretty good. EarthBound is my must play of the month, and I suggest you get some sort of emulator to play it on.